The infinite monkey theorem, according to Princeton University, states that when a monkey randomly hits keys on a keyboard for an infinite amount of time, it will almost surely produce any given text, such as the works of Shakespeare. But this isn’t thousands of monkeys at thousands of keyboards–this is thousands of monkeys at a single keyboard, and it’s every bit as chaotic as it sounds. The premise of Twitch Plays Pokemon is simple: as of last week, Twitch.tv has been streaming a game of “Pokemon Red” that anyone can contribute to. In order to play the game, thousands of people input commands into a chat window, and, after a delay of 20 to 40 seconds, the command will be executed. The game hinges on two systems of government: anarchy, where almost every command is executed, and democracy, where the most popular input is executed after a 20-second voting period. To switch from one system to the other, a certain percentage of votes must be made for the opposing system–80 percent to switch from anarchy to democracy and 50 percent to switch from democracy to anarchy. Unfortunately, players can never seem to agree on a system for long, and rallying cries of “anarchy” and “democracy” constantly slow the game down. As we have reported in the past, the San Francisco-based Twitch.tv allows its users to watch live and recorded streams of video games and broadcast their own. At the end of 2013, the company averaged over 900,000 unique broadcasters per month, with 10,000 live broadcasters. It had more than 45 million monthly viewers who watched, on average, 106 minutes of video each day. Twitch Plays Pokemon has shattered those statistics, with more than 20 million total views and more than 140,000 subscribers. Many of these viewers may regularly use Twitch, but a significant portion consists of people who play, have played, or enjoy Pokemon in general. For the most part, Twitch Plays Pokemon involves the protagonist, Red, constantly running around in circles, banging into walls, opening and closing the menu, saving the game, trying to use items in his inventory that serve no immediate purpose in the game, and spending hours upon hours trying to surpass simple obstacles that even first-time Pokemon players can easily evade. Despite this–and some other setbacks, such as the accidental release of pivotal Pokemon–the participants of this “social experiment” have somehow made it through more than half of the game. 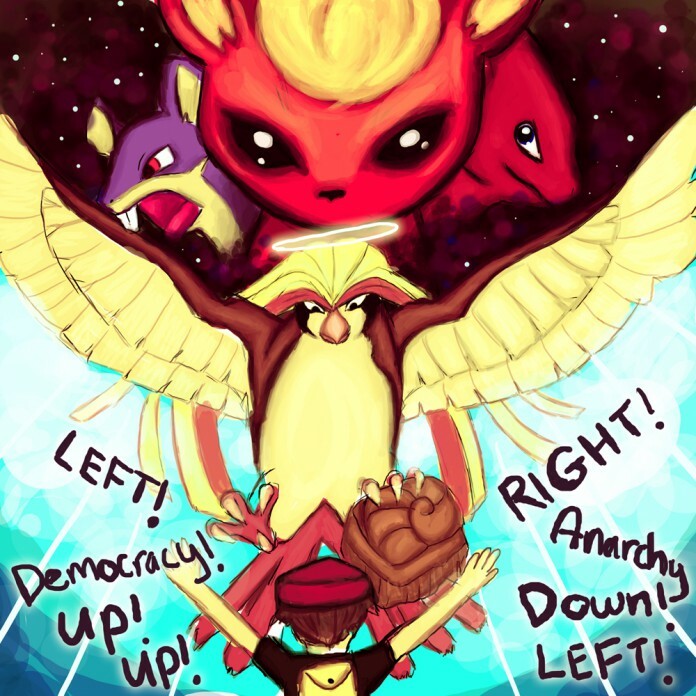 Over the past week, Twitch Plays Pokemon has become an entity of its own, as its followers have established an elaborate backstory and religious narrative for the game, bringing in new layers of character and plot development that the original game may have lacked. A dedicated community has been created on Reddit that documents events as they happen, allowing viewers to remain up to date with the constantly changing game, and dozens of artists have submitted fan art for the experiment’s own canon. Those who believed that the players would likely quit early on in the game have been proven wrong, as Twitch Plays Pokemon’s players refuse to stop, determined to finish the game despite the perpetual strife and disagreement. Either way, people from all over the world are uniting under a single cause.